Page File El Reg bookworm Mark Diston looks at the latest from the literary world with a splendid overview of scientific discovery from Steven Weinberg. Musician Kim Gordon kisses and tells on her life in and outside the band Sonic Youth. And for a Valentine's flavour, we look at the latest from award-winning novelist Anne Tyler. Steven Weinberg is a Nobel Prize winning physicist and the author of many popular books on science. He first came to my attention with The First Three Minutes, a simulation of the early moments of the universe written in a very clear and imaginative style. 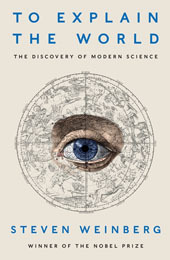 Weinberg has now turned his attention to a history of the discoveries of science. The first thing to divulge about this book is its unusual format, as Weinberg spends a great deal of time with the Ancient, Arab and Renaissance scientists. This enables him to really demonstrate the old cliche of “standing on the shoulders of giants”. Weinberg begins by calling the early pre-Socratic philosophers “poets”. He postulates that mathematics may be derived from music – both concepts very popular with the followers of Pythogoras. He observes than the Hellenistic era was a golden era of science and outlines the work of Euclid and Archimedes. Aristotle is probably the most oft mentioned name in this book, as his influence on succeeding Arab and Renaissance scientists was phenomenal. His name was a byword for rigorous investigation and it was his ideas which most influenced “natural philosophers”. “Whatever the scientific revolution was or was not, it began with Copernicus.” Weinberg points out that his original concept of a Heliocentric system was based on “No experimental evidence” though this was not long in coming. We move on to Tycho Brahe and Johannes Kepler, whose observations and records proved Aristotle wrong and Copernicus correct. It is interesting to note that Kepler had to cast horoscopes as part of his job description. Steven then points out Isaac’s extensive writings on alchemy and religion and also his obsession about finding the date of embarkation of Jason and the Argonauts! Newton indeed seems to define the border between superstition and reason. The scientific era post-Newton is almost an afterword in To Explain The World. Weinberg rushes at breakneck speed through the last three centuries and we are done. There are also a hundred pages of equations and diagrams for all the formula fetishists out there. So, Steven Weinberg has written a back-to-front, upside-down history of science and I have to say it is a tremendous work. By concentrating the ideas of the distant past, he avoids the learning curves usually associated with these works. Ideas are introduced in a gradual manner and are much more easily absorbed than diving straight in to more complex recent discoveries. Steven Weinberg has a fine gift for communicating ideas and uses an engaging layperson’s language. There are too many science books which brush over the pre-Newtonian era and end up disappearing up their own quantum dilemmas. To Explain the World is a much better method of introduction to the history of scientific thought and stands out in the ingenuity of its format and in the clarity and accessibility of Steven Weinberg’s prose. Which keys should I press to enable the CockUp feature? Or is Cupertino simply juicing the rumor mill?